DPS executed the full project engineering design for a new single use Cell Culture Suite at Janssen Biologics site in Cork, Ireland. DPS Engineering executed the full project engineering design for a new single use Cell Culture Suite at Janssen Biologics site in Cork, Ireland. The main project drivers were to provide experience in fed-batch processing and to provide internal supply chain capacity for fed-batch material. The facility was designed to provide pre-clinical, clinical and commercial capacity and for multiproduct capability on a campaign basis and to be fully MES enabled. 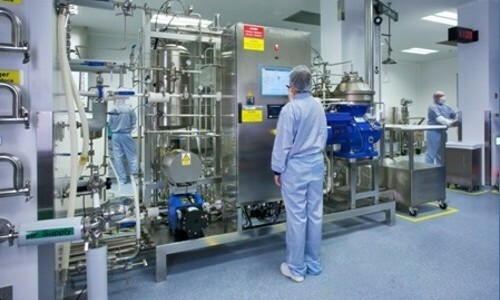 The facility included use of single use bioreactors (SUB’s) and single use mixers (SUM’s) from proprietary suppliers with integrated DCS control on board, up to 1000L. The facility included a pre-culture suite utilising wave bag technology, cell separation systems, protein capture and product isolation systems in an ISO8/7/5 clean room environment. One of the major successes of this facility is that it went from design to batch in 12 months.